Image Description: Me on CNN. Michigan Ave/Chicago River behind me. 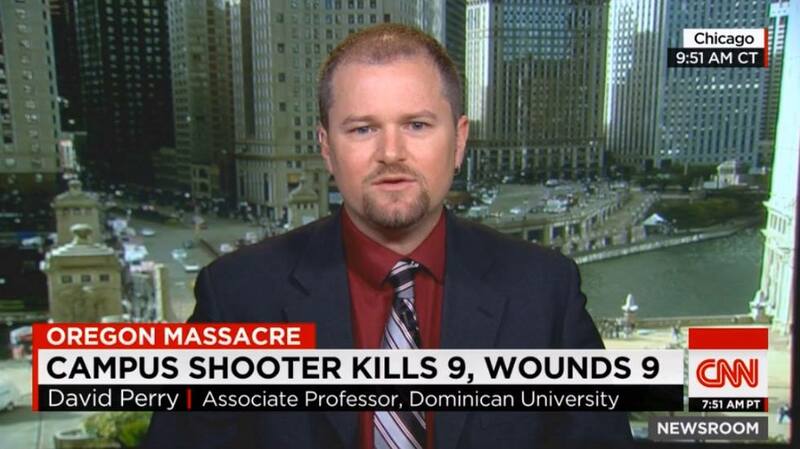 I went on CNN on Friday, 10/1, to discuss the terrible shooting on a community college campus in Oregon. CNN hasn't released a clip so I can't show it to you. I'm glad to have had the chance to go on the air and say some of the things I believe. I was originally supposed to be paired with John Lott, a man who believes that more guns equals less crime (they don't). The show decided instead to separate us and so by the time I came on, the host wanted to talk about other things. I had about 90 seconds and said three sentences. 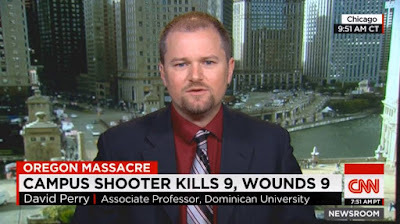 I described our upcoming active-shooter drill at Dominican, about which I will write next week. I said that I do not want guns on campus. I said that I do not believe adding more guns in the form of armed civilians will make us safer. Then my segment ended fairly abruptly. At any rate, 90 seconds is a difficult time to make one's stance perfectly clear. Here are four things I wish I could have said more clearly on CNN. 1. I have no problem with highly-trained law enforcement positioned appropriately near campuses. Some universities are basically cities unto themselves, so they likely need their own armed police. My small suburban campus needs to coordinate its security with our small suburban police, the tactical units assigned to our area, and other highly-trained law enforcement officers. 2. I do not believe that allowing civilians, whether teachers, staff, faculty, or just random visitors, to carry arms on our campus is the right response. First, college campuses are sacred spaces to me, and I do not want to see them further profaned by these weapons of murder. More importantly, though, we cannot arm our way out of this crisis. If we turn every school into a fortress, mass shootings will move to the malls. Arm the malls, killers will go the churches. Arm the churches, then it will be little league games. We can take appropriate measures to defend against copycat killers, but cannot stop gun violence by reacting to the specifics of the last attack. 3. Around the world, there are people who are angry and potentially violent. People hate other people. People get personally slighted. People have mental health breakdowns (though people with mental illness are vastly more likely to be victims than perpetrators of violence). It's only in America that these individuals are likely to react to their anger by using a firearm to commit an act of mass murder. 4. The only solution is to find ways to make access to firearms more difficult for people in those moments. There are simple steps - ban assault weapons, close gun show loopholes, expand background checks and waiting periods, share information across state lines, slow down the ability to purchase lots of handguns at once (used to buy from suburban gun shops and bring to illegal urban markets), and remove the Congressional ban on government-sponsored research on gun violence. None of these steps will restrict the ability of Americans to acquire firearms to hunt, for home defense, or even for conceal-carry purposes. But it will slow the flow, and that's what we need right now. We cannot arm our way out of this crisis. Some resources on gun violence. Whitehouse.gov on gun violence.